One day ago my dev ShP environment stopped working, showing 500 Internal Server Error. I have replaced all certificates to new ones (within the validity period), cleared certificate cache, modified IIS bindings for each website using the newly installed certificates. Removing this certificate, performing iisreset as well as computer restart doesn't help - it magically appears here again. Really don't know how to deal with this error so any help will be greatly appreciated! Check the if the Certificate added into the central admin, Central Admin > Security > manage trust, if old cert is still here delete it. Also check from the IIS, if that certificate bind to any other IIS site. Also remove from the IIS Server, Click on Server Name in IIS > middle pane click on Server Certificates...Make sure old certificate is not present here. 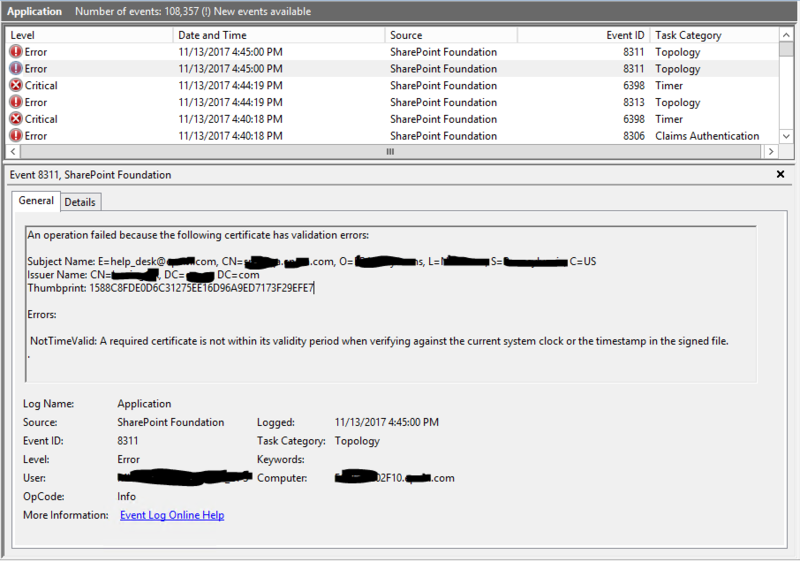 Also check following folders from Certificate store(via MMC), Personal, Trusted certification authority and SharePoint. You can also do a search from top level and look for your old cert. The root cause was wrong STS token signing certificate. Replacing it with a new (correct) one solved the issue. Not the answer you're looking for? Browse other questions tagged 2013 sharepoint-enterprise sharepoint-server ssl certificate or ask your own question.